My unofficial rain gauge (actually a straight sided ice bucket placed on the balcony), recorded 40cm (16 inches) of rain in forty-eight hours here in central Tokyo. Actually it could have been more as I found it full twice and have no idea how much may have over run the brim. When it rains it pours, as it were. Thankfully the second typhoon heading our way looks to have veered to the north and the archipelago may only receive a glancing blow later today. Typhoons are a fact of life in Japan. Death, taxes, typhoons and earthquakes as the saying goes. The country is well prepared, the classical ceramic tile roofs being designed to hold on in the high winds. But this typhoon was different, it was slow, meaning the intense rains lasted for longer as the storm slowly edged by. Strangely, it really wasn't that windy by the time it arrived here, though the 120,000 people of Hamamatsu, a coastal city some 250km to the southwest of Tokyo, who had to evacuate in advance of the deluge, probably had it worse. 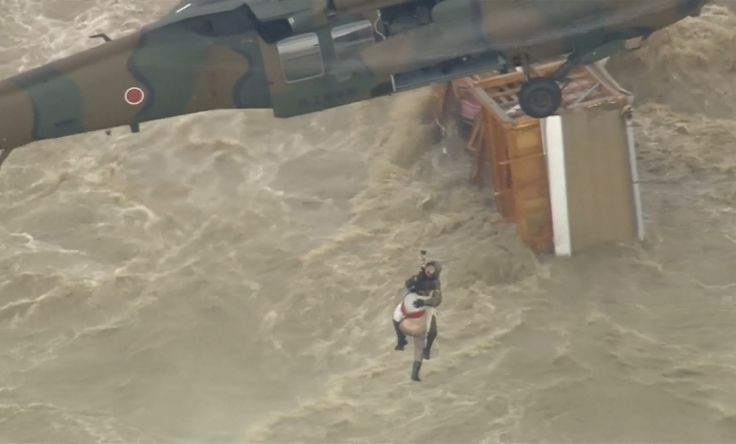 Japan is a largely mountainous country and, as a result, prone to flash flooding. When the rains come, the run-off can be quick and violent and this time took out an entire district of the city of Joso, near the ancient city of Nikko, and more than twenty five people are currently missing though one lucky man was winched, carrying a dog, from his roof to the safety of a rescue helicopter less than five minutes before the waters took the entire building. For now though the rains are gone and the skies blue; but enjoy it while you can, tomorrow we'll be wet again. Stay safe where ever you may be.